← NEW release coming soon for teen readers! Black Coven – Cover Reveal! 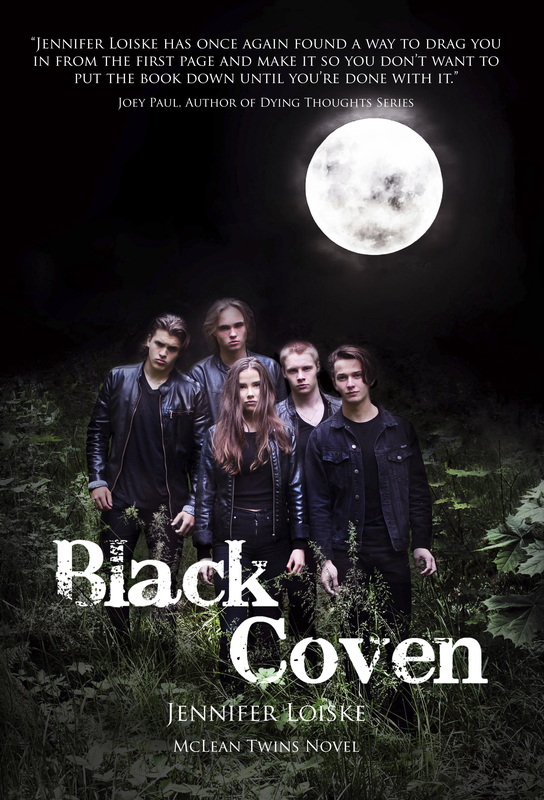 We are happy to present you the brand new cover of Black Coven, the final part of McLean Twins series! Special thank you to the cover designer, Eveliina Tommola, photographer, Iida Loiske and the cover models, Veera Kaasalainen, Alvar Silvennoinen, Sami Oujlouq, Elias Untamala and Filip Slotte. And of course to our writing team that is working 24/7 to get this adventure to you before Christmas! Shannon stared at the old stone manor with a haunted look in her turquoise blue eyes. Twenty steps to the front door. Twenty. Steps. And she couldn’t make her feet move. Last time she’d been standing on this exact same spot she’d had the creeps. This time, well, she still had the creeps but for completely different reasons. This time she knew what was hidden in that house. “I can’t go there.” She turned to her twin brother. Ian put a hand on her shoulder. “I know, but we have to.” Shannon bit her lip, her face twisting awkwardly. She hated the sick feeling inside of her. That small nagging voice that was screaming ‘go, leave while you can, or else you’ll be dead before the day is over!’ and yet there was absolutely nothing she could have done to prevent what was yet to come. Nothing that would justify her turning her back on the black future awaiting inside of that house, and going back living in her relatively safe past with her crazy family. “Sis, we have to.” Ian’s gaze nailed her on the spot, warning her, he would not give in an inch. Running away was not an option anymore. They’d come too far to back away now. “I know,” Shannon breathed, turning her eyes back to the manor, and examining the building as if it was a nasty tomb full of deathly snakes, which in some ways, it was. “I know,” she said again, trying to sound more strong and confident than a minute ago. Ian was right, of course, and she knew she should’ve been braver. After all, they had faced so many demons, witnessed horrible things and even committed some serious black magic spells, that she shouldn’t get jumpy in front of their father’s house, but in that moment she would have given anything to go back to London under her weird aunt’s witchy eyes, and to see her silly cousins, Bo and Blossom. As if that would never happen, she thought darkly. They’d tried to blend in, playing happy family with their precipitously found relatives, and still the darkness had found them. They’d screwed up royally, but obviously so had their father, Connor, as the last phone call from his house had ended up by someone screaming for her life, and the house that has once been only creepy old house, now seemed to leak death and poison from its cracks. Shannon huffed couple of times. Deep breath in, long breath out. Yep, every now and then normal would have been nice. Instead she had a demon to beat, and not just any demon, but her father. The story of McLean Twins starts here. Jump in and enjoy the ride! This entry was posted in McLean Twins Series and tagged cover reveal, Demons, Jennifer Loiske, McLean Twins Series, myths, Paranormal, Rogue House, Spells, suspense, Teens, urban paranormal, Witches, Young Adult fiction, Young Adults. Bookmark the permalink. 1 Response to Black Coven – Cover Reveal! The cover reveal of BLACK COVEN, final part of McLean Twins series! I’m so excited!! !